Why is it that conservatives, and even many moderates, see in The Times a blue-state worldview? Let’s set aside for now the core of their criticism — that the coverage is in fact biased. I’ll be turning to that as I settle into the job. My focus here is only on the perceptions. Because while one might debate the substance of the claims, the building blocks that created them are in plain sight. The home page is a good place to start. Anchoring its top right corner is the Opinion section, which promotes the columns and editorials of its mostly liberal writers. “Readers know the difference between opinion and news,” you’ll often hear. I’m not so sure all do, especially when the website makes neighbors of the two and social platforms make them nearly impossible to tease apart. Maybe we’re well past worrying about that. So turn to the drumbeat of Hillary Clinton campaign ads on the website. Even for me, who fully knows an ad from a news story, seeing Clinton’s smiling face when I’ve come to read the news can be rather jarring. 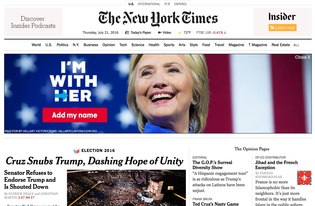 Readers often run across ads like these on The New York Times’s homepage.